This is very rare. Fluorite growing roundly? Rare. Rare earth element yttrium inclusion? Rare. 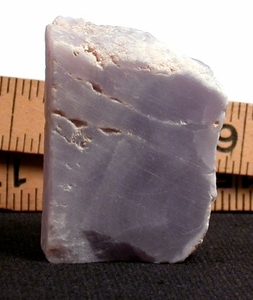 This piece has been neatly cut with three natural edges to show both the botryoidal growth habit and the deep lavender color range. Self-displays three ways at 1/2x 1-3/8x 1-3/4", miniature sized. Backlight it if you like, add it to your altar for focus, but prevent sun exposure to keep its' natural beauty. From Brown's Canyon District, Colorado.